One Billion Strong: Can Chinese Megacities Lead on Urban Conservation? I recently returned from a trip to meet a dynamic group of colleagues who are working to bring nature to cities in one of the fastest-urbanizing nations in the world: China. The future offers tremendous environmental risk from urbanization, as well as incredible potential to bring nature’s power to cities, and I’m sure of one thing: Whatever happens, China will be at the center. The scale and speed at which China is urbanizing is unique. Over the past three decades, China has experienced an unprecedented economic and social transformation. Millions have been lifted out of poverty as the country modernized and focused on manufacturing. In this time, more than 400 million Chinese citizens have moved from the countryside to cities. More than 100 cities now exceed a million people, and by 2030 a billion Chinese will call a city home. This is truly the greatest migration in human history. Cities exploded onto the scene—with no example more telling than the southern city of Shenzhen. In 1980, Shenzhen was a fishing town of 25,000, and today, it’s a megalopolis of more than 10 million and growing. There are countless similar examples, and every year 15 million Chinese more flock to urban centers. That’s an additional New York City every year! China is rightly proud of this incredible achievement at breathtaking scale and speed, but it has also come at a terrible environmental cost. Polluted rivers, toxic air and littered coastlines. For nature lovers and conservationists, these are troubling scenarios. Vegetation and trees to clean up city air? Many Chinese cities experience regular severe air pollution, mainly from coal-fired power plants and heavy car use. While I was in China, the Internet exploded over images of Mark Zuckerberg jogging in Beijing. I watched the smog descent over the skyscapers out my hotel room window, and my eyes got irritated and I coughed as I walked around the city. The main problem is extensive fine particle dust, especially PM2.5, which penetrates the lungs and blood stream and can cause bronchopulmonary and cardiovascular illness. The World Health Organization estimates that 7 million deaths worldwide are attributable to air pollution each year. Beijing often exceeds 25 μg/m3 over 24 hours, the safe level for fine particulate matter set by the World Health Organization. While trees cannot make a major dent in the overall reduction of poor air quality across an entire city, many studies have shown the positive impact strategic tree planting can make on a neighborhood level. Trees can have a strong local air cleaning effect—20 to 50 percent of fine particles can be removed by the leaves of trees within in a 50-meter (164-foot) radius. So planting trees near schools, hospitals and pedestrian zones can dramatically improve local air. Additionally, these trees can have beneficial impacts on energy costs (cooling the surrounding areas) and biodiversity. Green infrastructure to manage water in “sponge cities”? Like many large urban areas, Chinese cities have experienced extreme water conditions, ranging from severe floods to dramatic water shortages. In response, the central government has challenged cities across the country to explore the "sponge" concept and become more better managers of their water. The Nature Conservancy’s water fund work, our coastal resilience experience, and our stormwater projects can all help Chinese cities achieve their targets. Twenty Chinese pilot cities have been identified, and the Conservancy will start working with the urban planning institute, the forestry service and the cities themselves to identify how natural solutions can support the sponge city concept. Like everything in China, things have to move fast - the first sponge cities are to be up and running, managing 60 percent of all rainfall in only a few years! Bird sanctuaries to connect city youth with nature? Across the industrial world, wild outdoor urban play areas have all but vanished in just one generation. In the United States, teenagers now spend more than half their waking hours looking at a screen. And most urban kids declare that they feel “fearful or anxious” about exposure to nature. China is no different. Just check out the way most people are glued to a device as they navigate the streets and subway! So how do we connect more young people with nature? How can we transmit the wonder and love we feel for the natural world so that, when they grow up, they will care for nature and become conservation supporters? One tried and true strategy is to provide opportunities for urbanites to visit nature preserves. 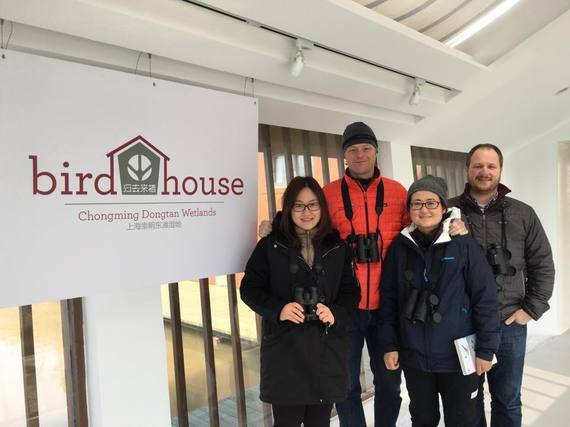 I had the opportunity to spend some time at the Chongming Dongtan Birds National Nature Reserve, located just 90 minutes from downtown Shanghai. Located on an island at the mouth of the Yangtze River, it provides habitat for millions of swans, geese and shorebirds, like the dunlin, great knot and whimbrels, which travel along Asia’s north-south migratory route from as far away as Alaska and New Zealand. It’s also a designated “green island” which local leaders are using to encourage ecotourism, an environmental awareness. All senior Shanghai city officials, including the mayor, have already visited. So have several corporations. The goal now is to expand the numbers and get more people out there. After all, you only protect the things you love. I had the opportunity to attend meetings with many inspiring individuals who are working on urban sustainability, and I saw lots of great on-the-ground work in China. One consistent message was the need for more fact-based, science-driven decision making in Chinese conservation. Which trees can help manage car emissions? What is the ideal network of green infrastructure to mitigate storm water? How can we accurately measure biodiversity in a city? Which metrics are best to evaluate usage of a park? The Nature Conservancy’s experience—in the United States and around the world—is deeply rooted in science, influencing policy and working with a broad cross section of diverse partners. We started brainstorming with our Chinese colleague on a series of studies and local interventions to make a difference for Chinese cities. Science is truly a universal language. Urban conservation isn’t a separate initiative in China, it’s fully embraced by our local staff and integrated into their work to protect people and nature across the country. My colleagues and I saw environmental volunteers cleaning up trash in mangrove forests. We visited nature preserves and we experienced city life. And time and again, we saw the important role that nature will play as Chinese cities develop. With more than a billion people and a growing economy, it’s inevitable that China will have a large environmental footprint. But after spending two weeks learning from my colleagues and seeing what they value about their cities, I’m filled with hope for the burgeoning sustainability movement in China. Change comes quickly here, and with the right partnerships, truly transformative conservation work is possible. I can’t wait to come back to Shenzhen in 2026 to celebrate all that’s been accomplished.